In the way that one is apt to crave things that are unattainable, I fall in love with the idea of Yotam Ottolenghi’s London cafes all over again every time I hear about them. And I have heard of them frequently in recent years, as Ottolenghi is something of a sensation in the culinary world, especially among vegetarians in search of fresh flavors and ideas. His innovative cooking relies heavily on vegetables and combines bright, lively flavors from around the world. He has published two cookbooks (Ottolenghi and Plenty) and has a third on the way. All this is to say that it’s Ottolenghi’s deli case that I dream about when I fantasize about having a ready-stocked supply of amazing salads in my kitchen at all times. So I was disappointed when the first recipe I tried from his vegetarian book Plenty turned out to be a dud in my kitchen (it was a saute of brussels sprouts and tofu that Dana Treat loved, so who knows where I went wrong). This recipe, though, reminded me what all the hype is about. The fritters themselves are delicious–well-spiced with a hint of an exotic flavor from the turmeric, which you could spin by using Mark Bittman’s adaptation containing cardamom instead as Hannah did when she inspired me to go dig out this cookbook. The thing that made this recipe for me, though, was the yogurt dipping sauce, the leftover bowl of which I considered eating for breakfast this morning. It wouldn’t make a bad meal by itself. 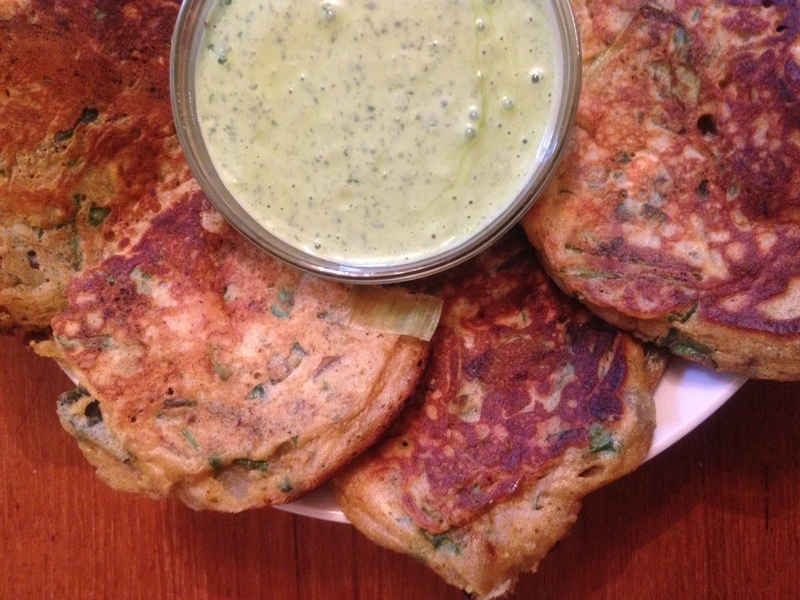 Leek Fritters with Cilantro Yogurt Sauce: Make your sauce first in the food processor by pureeing 1 c. Greek yogurt, 2 crushed cloves of garlic, 2 Tbsp. lemon juice, 1 Tb. olive oil, 1/2 tsp. salt, 1/2 cup chopped parsley, and 2 c. chopped cilantro (I used a whole bunch with the biggest bottom stems chopped off). Set aside to let the flavors blend while you make the fritters. Slice 1 lb. trimmed leeks into 1/2″ rounds (when I have fresh organic leeks, I use quite a bit of the green part as well, just slicing off the darkest green tops that are less tender–and saving those for stock, of course). Saute washed leeks with 1/2 lb. finely diced shallots or red onion in olive oil over medium heat until soft. Add leek mixture to a bowl with a minced red chile, 1/2 c. chopped parsley, 3/4 tsp. ground coriander, 1 tsp. ground cumin, 1/4 tsp. ground turmeric, 1/4 tsp. sugar and 1/2 tsp. salt. In a separate bowl, beat one egg white until it holds soft peaks, then gently fold it into the vegetable mixture (Ottolenghi’s recipe doesn’t use the yolk from that egg, but I added mine to the veggie mixture before folding in the whites). In a third bowl (yes, I know, sorry! ), combine 3/4 c. plus 1 Tbsp. flour with 4 tsp. baking powder, a whole egg, 2/3 c. milk and 4 1/2 Tbsp. melted butter to make a batter. Fold the batter gently into the bowl of vegetables and spices, then fry fritters over medium heat until golden and crisp. Move to a paper towel-lined rack set on a cookie sheet in a low oven while you continue making the rest. Serve warm with the sauce for dunking or drizzling. Leftover fritters reheat nicely in the toaster oven, and I imagine that the sauce would be fine in the fridge for a week if you could possibly hold yourself back for that long. This entry was posted in Eggs, Vegetables By Themselves and tagged cooking, dinner, DIY, eggs, family, food, fritters, homemade, lifestyle, recipes, vegetables, vegetarian on May 4, 2012 by emmycooks. There are few things more tasty than a fritter, and these look grand! I like Ottolenghi: The Cookbook better than Plenty. The recipes in the latter have been a little hit or miss for me, too—perhaps not surprising given their origin as part of the weekly newspaper column. Looking forward to the 3rd one though. I’ve been after a good fritter recipe – this could just be the one my friend! They look (and sound) amazing! Oh, isn’t that sad when you try out a new recipe from a book and it doesn’t turn out? Sometimes that happens, though. But I am so happy that you persevered and made these fritters! They look great and the cilantro yogurt sauce looks like the perfect compliment. I like Ottolenghi’s books and column a lot. I wish that I had the chance to make it to one of his outposts in London the last time I was there. There was just too much to eat and too little time. Next time, I’ll eat it all! The fritters sound nice but there is no way I could eat something with 2 cups of cilantro in it :-( 2 tablespoons would already be pushing my tolerance for cilantro. Would it be worth making with a substitute herb? And I really need to get an Ottolenghi cookbook, STAT.